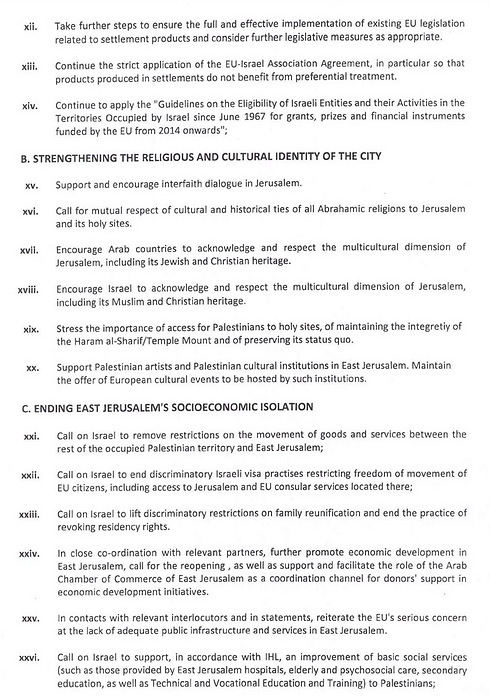 Leaked report outlines 40 suggestions to sway Israeli policy; EU source: more chance of implementation in wake of Netanyahu rejection of Palestinian state. 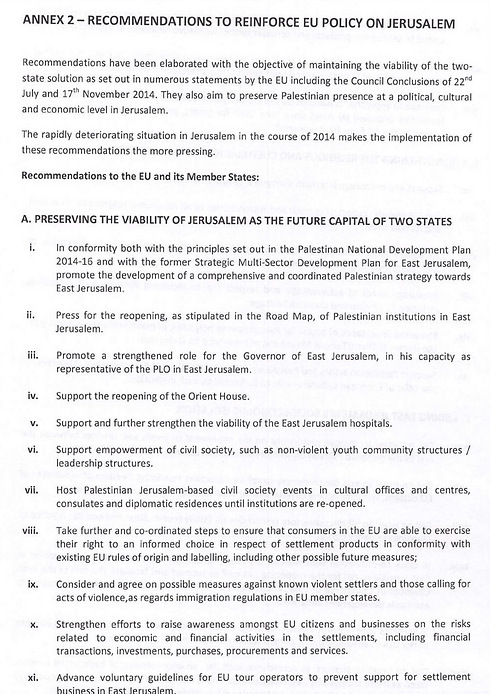 An EU diplomatic source told Ynet that there was a definite chance that the recommendations in the report, which the member states have yet to approve, were more likely to be implemented following Prime Minister Benjamin Netanyahu’s statement during his election campaign that a Palestinian state would not be created under his rule. The diplomat said the EU does not believe Netanyahu’s subsequent backtracking on the creation of a Palestinian state. He added that Europe is interested in having a positive relationship with Israel, but considers Israel to be an entity that does not extend beyond the Green Line – the boundaries of Israel from its founding in 1948 until the 1967 Six-Day War. “If Israel continues its policy beyond the Green Line, it will affect the relationship between European nations and Israel,” he warned. The heads of diplomatic missions in Jerusalem and Ramallah recommend several steps in the report, and the majority of the 40 recommendations may be hard for Israel to swallow. The European source hinted that the election results and expected formation of a right-wing government in Israel mean the recommendations will be taken especially seriously by the EU.